This feature is only available to registered users. To continue, please log in or create a free account. The world's only teddy bear that keeps families connected. Record loving messages and stories, in your own voice, for your little one to hear every night on the super cuddly Cuddletunes Bear. Cuddletunes has a real MP3 player and speakers sewn right inside! Play any MP3 music, plus your own recordings that you create using the easy Cuddletunes web site. 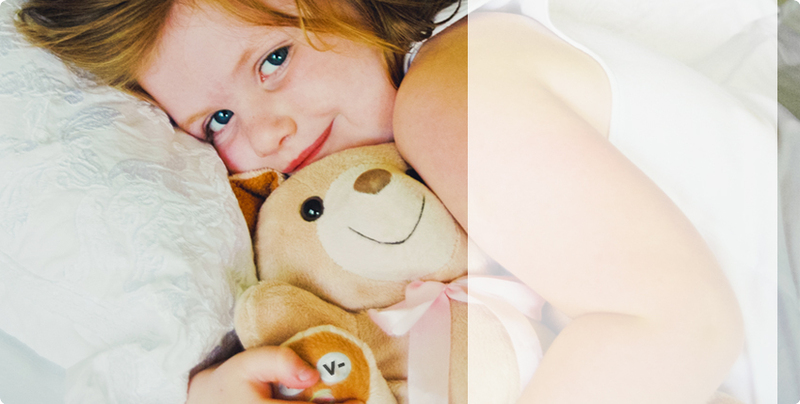 With MP3 lullabies and the reassuring sound of your own voice, Cuddletunes makes bedtime easy and fun! We are not able to detect any input from your microphone. If you were speaking, it's possible your microphone is unplugged or switched off or it's possible you don't have a microphone. Please review the information below. First, look around to see where your microphone is. If you have a laptop computer, the mic is probably built into the display (it usually looks like pinhole in the display frame). If your laptop is closed in a docking station, you probably need to open the laptop for the mic to work. If you have a desktop computer, your mic could be built into the display but most often will be a separate device. Once you find the microphone, see if it has a switch and if so make sure the switch is on. Try recording again and make sure you are facing the mic and not too far away or too close (8 to 12 inches away is usually good). Also, make sure that your speaker volume is turned up so you can hear the playback properly after you record. If you can't find the microphone, you probably don't have one. You'll need to get a microphone or access cuddletunes from a different PC that has one. You can skip this step for now and try it again later from a different PC or after you get microphone.